We specialise in helping clients clarify their desired goals and achieve success, offering our expertise in the “people side” of that process. While our current focus is working with the Aged Care sector, our services are also used by clients across community, business and government sectors. We work with individuals, groups/teams, organisations and communities, investing in the wisdom and capacity of people to build positive relationships, create new ideas and put in place the innovations they need to be successful. We started working together 14 years ago here in Melbourne, Australia, when we combined our separate businesses into BJ Seminars International. 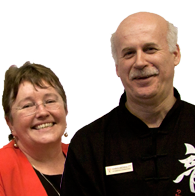 Sue’s many years of facilitation and Appreciative Inquiry experience and Chris’s over 30 years of Tai Chi experience led to the creation of the process we use in our work – the AQ-KQ® framework, a unique combination of Appreciative Intelligence® and Kinaesthetic Intelligence, drawing on both Appreciative Inquiry and Tai Chi. Contact us now to discuss how our facilitation and training expertise can help you make the transformation you need to become healthier, more efficient, productive and successful.